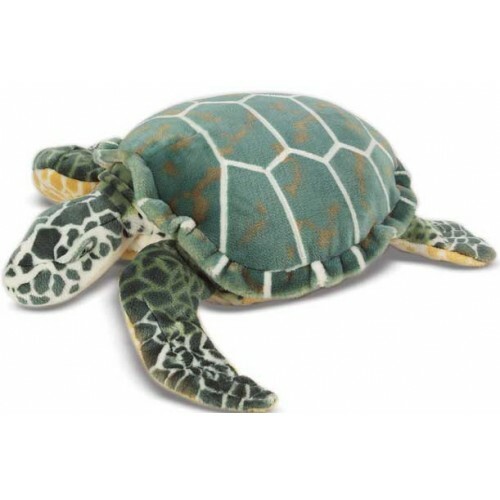 Sea Turtle Plush Stuffed Animal, this realistic creature of the deep features excellent quality construction and careful attention to its lifelike markings. Nearly three feet long, this lifelike sea turtle is not shy! A delight to hug, use as a pillow or just snuggle up with, this realistic creature of the deep features excellent quality construction and careful attention to its lifelike markings. Wild Animals by Melissa & Doug. Go wild! From the Amazon to the Savannah here come lions and tigers and monkeys! With life-like expressions, these animals add excitement to any room. Passionate about plush stuffed animals? Melissa & Doug has over twenty of the most popular dog breeds, as well as giant teddy bears and a giraffe that's four feet tall! Our stuffed animals represent the animal kingdom from different regions of the world and span the alphabet, from Alligator to Zebra! All of our premium quality plush creatures are incredibly detailed, and are available at such a low price that everyone can start a personal petting zoo! By land or by sea, we've got plush pals for every kid to love! Makes a wonderful accent for your child's room plus it's perfect for use in daycares, pre-schools, schools and doctor's offices. Dimensions: 8" x 28" x 28"